Hello! I'm so pleased to be participating in the Hooked! Crochet Motifs Blog Hop today. Hooked!, by Michelle, Cecile and Sylvie Delprat, is a brand-new book of fun, adorable crochet motifs, to be published this spring. Stitch Craft Create, an online craft shop, invited me and other bloggers to review Hooked! and try out the patterns. I loved everything in the book. There are sweet little animals, fruits and flowers, hearts and stars. I was particularly drawn to the motifs on page 12, as seen above. There was the sweetest little strawberry and I knew just what to do with it. I designed a crocheted wall decoration for my strawberry-themed kitchen! It was fun to make and I think it came out really cute. Would you like to make one yourself? Follow along with me and I'll show you how. 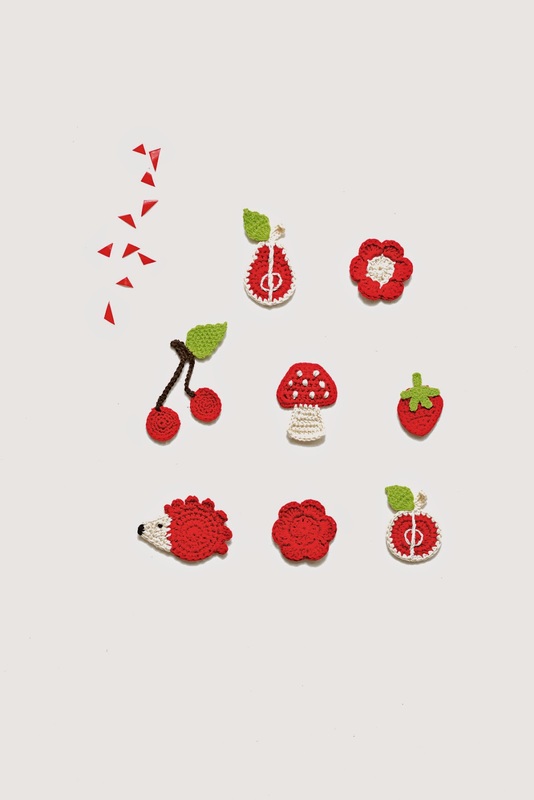 You don't have to make strawberries, there are lots of other motifs to create. I love those little berries, though, and you know much I love my kitschy strawberry kitchen! You'll need just a few supplies to make your decoration: cotton yarns in the colors of your choice, an crochet hook in the appropriate size (you'll want to work tightly, so you may want a smaller one than you'd normally use with your chosen yarn), a yarn needle and some ribbon. You'll also need sewing threads and a largish sewing needle. Optionally, you may also want to use a narrow wooden dowel and PVA (white) glue to complete this project. You'll need to make some solid granny squares to begin. I made three of them, about six inches wide. I made my squares in white cotton edged in one round of red. Solid granny squares are quick and easy to make, but if you've never tried one they can be a little tricky because there are no chain spaces in the corners as in a regular granny square. This simple tutorial may be helpful to you. Don't worry if your squares a little wonky; we'll be steam-blocking our project later. Weave in ends before moving on to the next step. Next, you'll crochet your squares together to make a strip. I used red yarn to blend into the outer rounds of my squares. Just hold the right sides of your squares together and slip-stitch through each stitch along the edges of both squares, starting with a corner. At the opposite end, fasten off the yarn and weave in ends. Now you have a strip of granny squares, ready to form the backdrop for your cute motif designs! First, I made three strawberry motifs and the accompanying leaf designs; both the strawberry and the leaf patterns are included in Hooked!. I found the patterns to be really simple and easy to follow and my motifs worked up quickly. I opted to embellish my strawberries with "seeds" - I just used some white yarn to make small stitches on top of the crochet stitches, sort of staggering them in rows downward toward the pointed end of the berry. Next, I got my motifs ready for sewing them onto the squares. I decided which leaves would go with which strawberry, and chose sewing threads in colors to match the motifs. Then I sewed my berries and leaves onto the squares. You'll want to use a fairly large sewing needle to poke through the crocheted layers and take care to catch the crochet stitches in your thread stitching, especially on the back of the squares. You don't need to sew a lot here, just enough to securely tack down the edges of your motifs. Tie off the thread securely when you're done. Now you're ready to block your decoration! Pin it securely to a blocking surface (I use a big piece of foam-core poster board with a towel over it, set on my ironing board). Stretch out the corners of your squares to make them nice and neat, then spritz the project lightly with water. Next, use a hot clothes iron to "steam" the project into shape. You can hold the iron just above the project or lightly iron it (if you used all-cotton materials). Then leave it to dry, pinned in place. I stiffened my project with some diluted PVA (white) glue once it was dry. In a small cup, I mixed Elmer's school glue with a little water to thin it. I applied the diluted glue to back of my project with a small art brush. Then I let it dry overnight and it was nice and stiff. Next, I turned my piece into a wall hanging. I opted to use a piece of 1/4-inch wooden dowel as part of my hanger (I had some help from my husband, who cut little slits in each end of the dowel for me). You don't have to use a dowel, you could make a simpler hanger from yarn, or ribbon. I thought a dowel would help keep the top edge of the decoration from buckling. I stitched the dowel onto the top square with red yarn, knotting the ends and using a simple whip stitch through every other crochet stitch on that edge. Then I wove in the ends of the yarn. Next, I cut a length of narrow red grosgrain ribbon, inserted it into my dowel's slitted ends and knotted the ends under the slits to secure the ribbon. Then I trimmed off the excess ribbon and my decoration was ready to hang in the kitchen. Strawberry-rific! I'm so excited about my new decoration. It brings some handmade, homespun charm to my kitchen, where I don't have very many crocheted decorations. It's fun to spread the crochet joy throughout the house, isn't it? This decoration brightens up my kitchen and adds a whimsical touch to the space next to my pantry, which has a solid white door and not much wall space for decorations. A narrow, colorful piece was exactly what I needed there. It was a lot of fun to design and to make, as were Hooked! 's sweet little strawberries. I hope you'll enjoy following along with this exciting blog hop! Posts will continue throughout the month of February. Check out the list of bloggers participating in this hop on the Stitch Craft Create website. I'm sure there will be lots of great posts. I'm thrilled, and very proud, to be involved with the launch of this new book. Stitch Craft Create also invites you to enter a crochet-motif competition! You could win a copy of the new book, six skeins of Stylecraft Special DK acrylic yarn and a 4mm Pony crochet hook. Click here to find out how you could be the winner of this fun prize package. Gorgeous crochet motifs! I love your strawberries, they look delicious! Wonderful. It will look perfect in your kitchen. It sounds like a good book, I shall look out for it. Oh, how I wish I could crochet, this is adorable. I love all the little motifs. It's beautiful Jennifer, I love strawberries too. You made excellent use of your little motifs! Ooh I like that. I just love that you have a strawberry themed kitchen too! Such a cute wall hanging! I'm sure it makes you smile every time you look at it! What fun it looks beautiful hanging in your kitchen. Love the look of the book. Your strawberries really look super cute - imho, thé perfect kitchen decoration ! And how cool is that, to be asked to review the patterns of a crochet book ! Congratulations !! That is such a cute project for a cute kitchen! Have fun playing with the rest of the motifs! Everything about strawberries says "cute, cute, cute" and your little hanging turned out sweet as can be. Years ago I thought to decorate my kitchen in them but ended up with a modge podge of eclectic things much like an old grandmother's country kitchen. All those motifs look like plenty of fun to make. It is great to be able to be a part of testing patterns for a new book. What a cute project, Jennifer. The red and white combination looks so fresh, and perfect for your kitchen. Love strawberries as a theme (made my daughter a sweet dress in white with tiny red strawberries when she was little), and I really like the cherries too. Lovely post! I almost missed this post. It didn't show up in my blog feed for some reason. But...I'm so glad I saw it. What a great tutorial. This reminds me so much of my childhood, which brings back good memories. Have a great weekend! Oh I Love It! Looks so Fun to make. Loving this Blog Hop. Thanks for Sharing! I would love if you shared this at our Yarn Fanatic Link Party - http://eyeloveknots.blogspot.com/2015/02/yarn-fanatic-linky-party-24-expression.html.